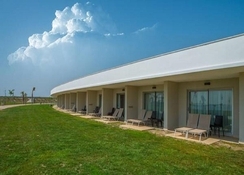 Savour a slice of Turkey's Aegean coast at the Aquasis Deluxe Resort & Spa. Long sandy beaches, stunning warm blue waters and the golden Turkish sun await you at this little haven. 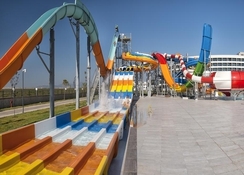 The Aquasis Deluxe Resort and Spa is a family-friendly resort situated near Altinkum Turkey. Adults can enjoy deluxe spa treatments whilst children can have all-day fun at the resort's very own on-site water park. The rooms here are wonderfully comfortable with a relaxing atmosphere and all the amenities you need for a chilled-out break. The resort also has dedicated kids' club and family-friendly entertainment as well as several restaurants and bars. The Aquasis Hotel in Turkey sits on the beachfront, putting the sea right on your doorstep. A short journey into the main town and you can be awed by visiting the historical wonders such as Apollo's Temple, Didyma and Kilise. 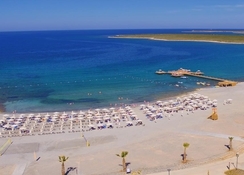 The hotel sits in the outskirts of Altinkum in Turkey, and is about 2km from the Altinkum Beach. This all-inclusive hotel can easily be your home away from home, but you'll also find great restaurants and bars in the city as well. Being located on the beachfront, you'll be able to get into the water or laze on the beach in no time. The nearest airport, Milas-Bodrum Airport, is 88km away from the hotel. There are many frequent services from the airport to the Bodrum area. Rooms at the Aquasis Deluxe Resort & Spa are stylishly furnished, tastefully decorated and spacious to provide you an uplifting feeling. You'll also find either a private balcony or sun terrace. Moreover, each room is fully-equipped with air-conditioning, 24/7 wireless internet access, television, in-room safe and much more. The Aquasis Hotel Turkey offers 660 guestrooms in Deluxe Room, Junior Suite, Executive Suite, Sunset Terrace Rooms, Pool Adjacent Rooms, Lake Rooms and lavish Superior Villa configuration. There are several restaurants available to choose from at the Aquasis Deluxe Resort & Spa, providing a little something for everyone. For authentic local cuisine check out Lalezar Restaurant with its menu of popular Turkish dishes. With its position overlooking the sea you can be sure to find excellent seafood at the Fangri Restaurant and Italian favourites, including a selection of pizzas and pastas at Olivia Restaurant. There are also five bars dotted around the resort, all of which are great places to pick up a drink. At Aquasis Deluxe Resort, you can enjoy making the most of all the great entertainment experiences on offer. The on-site water park is fun for all ages or you can enjoy a simple dip in one of the resort's swimming pools. Loosen up at the spa or take a trip to the sauna. Or for something uniquely Turkish try unwinding with a relaxing Turkish bath. It's also a great resort for catering to little ones, with a children's playground, club and great family-friendly entertainment. You'll scarcely need to venture beyond this excellent resort, but there are also some highly recommended visits to some impressive nearby sites that should be on your itinerary too.